TBs celebrates another anniversary! The fifth! This year I looked at the usual statistics graph (Page Loads and stuff like that) and thought to myself - It's flat at last! But then I returned to make some calculations on the raw numbers, and here the advantage of using the same statistics engine since day one (regardless of whether it is the most accurate or not), to realize they're still increasing. And not only increasing, but keeping the same pace as in the past year, which was of course quite lower then the first three years. Putting it in numbers the total amount of Page Loads YoY has increased 15,5% in th 5th year, while it had increased 15,2% in the 4th year. This probably means that we are getting close to the size limit of the Technic Community, but it seems to be a natural increase pace still (maybe of the community itself). This is a good sign if we realize LEGO Technic (LEGO with holes...) is not among the most favorite products from Billund's toy house. This was also the year where we created a companion page for TBs at facebook, and started using it to reach a new audience more keen to this kind of social media. This has been also a great media to share more info and more fans creations. in a light and faster way. Otherwise there is unfortunately no possibility to write a new and more detailed post for the blog, about every new worthwhile topic. This way we managed to share more and reach a larger readership. As everything comes with a price, one of the effects that we noticed was an apparent decrease to the comments left to the posts at Blogger, having some of them being canalized to the facebook page. Others are simply gone, as the community becomes more mature and interested to discuss the topics at dedicated forums, where one has a lot more freedom to post and organize their own content.. Finally it was not this year that we came to see a Technic fan model, reaching the official review phase on LEGO Cuusoo, but most likely it won't go beyond 2013. Stepping into what interests most... as usual our chef made something special for us to celebrate (thanks Alexandre). The journey continues ahead for another year... and in the meantime, Happy Birthday TBs ! ...and no, we didn't get the fifth editor this year. what's happening!!! 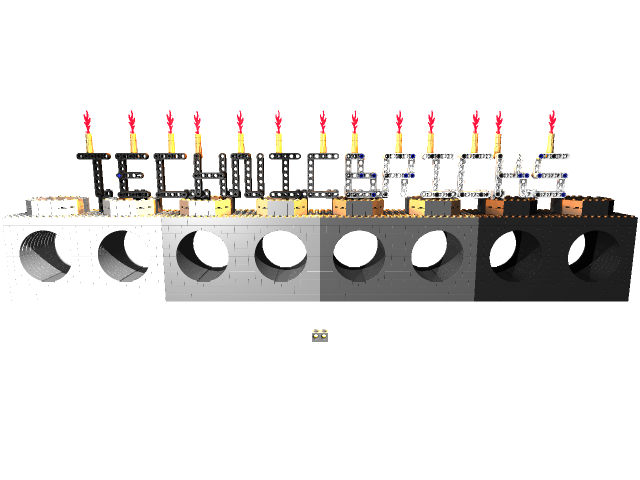 Nobody wants a Technic cake ? YEY! Congratulations guys, looking forward to many more years!